With a smart key, you can lock or unlock a door (and trunk) and even start the engine without inserting the key. Refer to the following for more details. • The button will only operate when the smart key is within 28~40in. (0.7~1m) from the outside door handle. - The smart key is in the vehicle. - The engine start/stop button is in ACC or ON position. - Any door except the trunk is open. 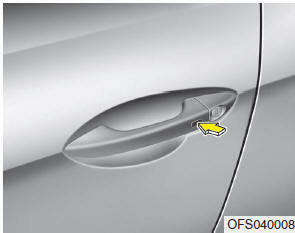 1.Press the button of the driver's outside door handle. 2.The driver’s door will unlock. The hazard warning lights will blink and the chime will sound two times. 3.Press the button once more with in 4 seconds. 4.All doors will unlock and the hazard warning lights will blink and the chime will sound two times. ❈If you press the button of the front passenger’s outside door handle while carrying the smart key, all doors will unlock. • When the smart key is recognized in the area of 28~40in. (0.7~1m) from the front outside door handle, other people can also open the doors. • After unlocking the driver’s door or all doors, the door(s) will lock automatically unless the door is opened. 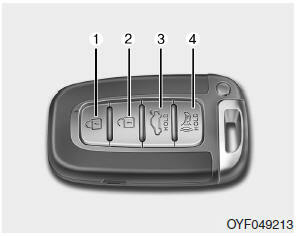 1.Press the unlock button (2) of the smart key. 3.Press the unlock button (2) once more within 4 seconds. 4. All doors will unlock. The hazard warning lights will blink and the chime will sound two times. After pressing the button, the doors will lock automatically unless any door is opened. 2. Press the trunk handle button. 3.When all doors are locked, the hazard warning lights will blink two times. Once the trunk is opened and then closed, the trunk will lock automatically. The button will only operate when the smart key is within 28~40in. (0.7~1m) from the trunk handle. 1.Press the trunk unlock button(3) for more than 1 second. 2.When all doors are locked, the hazard warning lights will blink two times. 1.Press the panic button(4) for more than 1.5 second. 2.The horn sounds and hazard warning light flash for about 30 seconds. To stop the horn and lights, press any button on the smart key. You can start the engine without inserting the key. For detailed information refer to the “Engine start/stop button” in section 5.